I’m looking to feature more Native designers on this blog, and to facilitate that, I’ve put together a questionnaire. I’m asking that designers submit images of their work, 3-7 pieces (typography, layouts, posters, t-shirt designs, logos, etc), along with their answers to the questions. (Please feel free to give me feedback on the questions themselves as well! Let me know if anything should be added.) Email me at neeb at neebin.com with your answers and images. Thanks, you awesome, talented designers! People need to know about us and what we do! What is/are your tribal affiliation(s), and where are you from? What do you do/what are your areas of expertise? How would you describe your style? What are your influences? How/when did you first become aware of graphic design as a field? Where did you go to school to study (or how did you begin practicing graphic design)? Who are some of your clients and/or where have you worked in a creative capacity? What are your favorite kinds of design projects to work on? Tell us about a project you are particularly proud of. What sorts of projects do you want to work on in the future? Have any design pet peeves? Do you have any creative heros or projects you admire? How does your ethnicity factor into your work or experience as a designer (if it does)? Are there any particular challenges you have encountered as a designer that you would like addressed? What would you say to young Natives who are interested in pursuing graphic design or are just beginning their design careers? Optional question: How can more Natives be encouraged/enabled to enter the field? This entry was posted in Uncategorized on October 1, 2013 by Neebinnaukzhik. 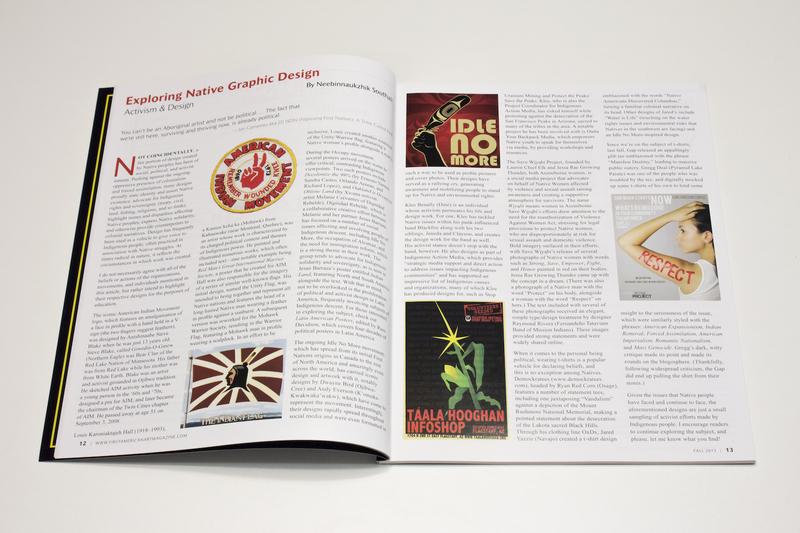 The latest issue of First American Art Magazine is out, and my column Exploring Native Design is centered around design in an activist context in this issue. 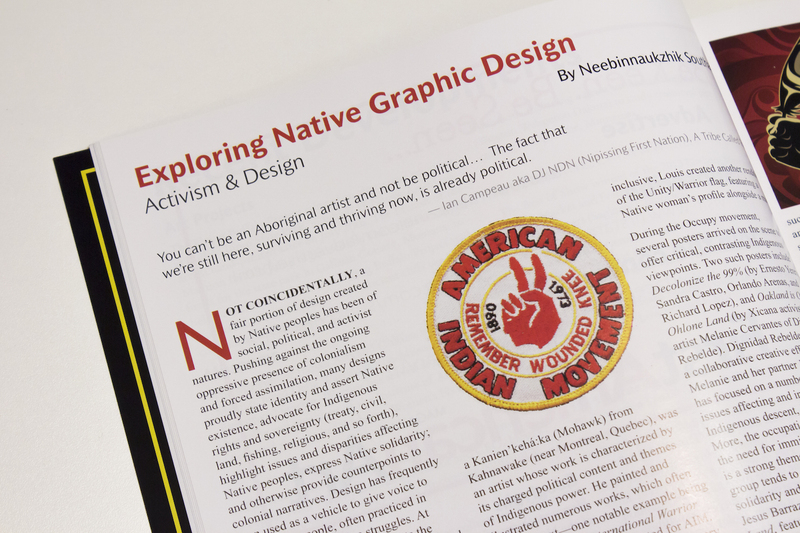 The article is a basic overview, giving brief examples of several instances of indigenous people using design as a form of activism. Mentioned in article: AIM/Steve Blake, Louis Karoniaktajeh Hall/Warrior Flag, the Occupy movement/Dignidad Rebelde, Idle No More, Klee Benally, Save Wiyabi, Political T-shirt designs – Demockratees and OxDx, and Gregg Deal’s take on the Gap “Manifest Destiny” tee. Good stuff! If the article becomes available online, I’ll be sure to share it here. Order your copy of the magazine here: Issue No. 1, Fall 2013. There’s some particularly excellent artist features in this issue, plus lots of other good articles.